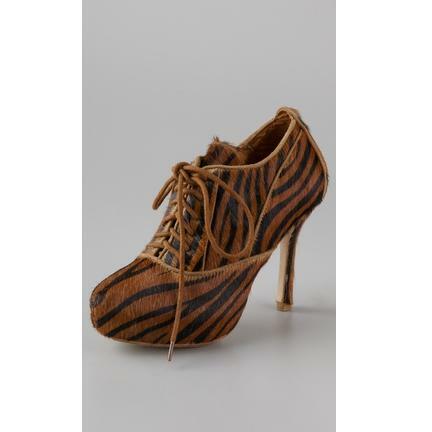 These Zebra haircalf booties feature suede piping and a lace-up closure. Thin inset platform under hidden platform. Covered stiletto heel. Leather sole. Available in Cheetah too. * Heel: 4.25″ (110 mm). * Platform: 1″ (25 mm). Plomo was founded in Mexico City in 2008 by Kelste Bilbao and Galia Katz, who have studied and worked in fashion in Spain, Mexico, and New York City. The name Plomo (meaning ‘lead’) is derived from the Spanish phrase ‘pies de plomo’ (‘lead feet’). Plomo makes shoes for the confident, sure-footed woman who walks through life with certainty and direction. Plomo shoes are made of Mexican leather with handcrafted details to enhance their character.